I’m really happy with the way Baby T’s nursery has turned out, and I’m so excited to share it with you today! It took me awhile to get it here, and of course my mom gave input and help as well, but I finally feel like it’s finished enough to share. Not 100% finished, but close. I decided to deviate from my normal white walls only rule, and paint the walls a pale shade of gray with just a tiny hint of blue in it. It’s Behr “Reflecting Pool,” and it give just enough contrast to make the white trim and furniture pop. I don’t usually go by a color pallete; typically I like white walls and pops of color. But one definitely emerged in this room: aqua and red and gray. Regardless, I stayed true to form with lots of handmade details and mostly re-purposed items. The rocker will eventually be replaced by one that works better with the decor of the room, but for now we have this golden-yellow one. Pretend it’s gray. The book shelves are picture ledges from Ikea. The rug is also Ikea – we’ve all seen it around. And the chevron pouf is handmade by Aletafae. The curtains you may remember from B’s San Francisco nursery, along with the matching crib skirt. My mom made both, which I still love and really like in this new space. My mom was kind enough to replace the old blue rick rack on the curtains with a bright red. She also painted the round side table as well as spray-painted the curtain rod, previously black, red; since I was preggo at the time. I could not have gotten this room done without her — she’s a pretty bangup crafter and decorator. This built-in cabinet is a great feature in the room. I don’t have the shelves styled properly yet, though; I’m still looking around for the right stuff. The crib is the Ikea Gulliver crib, the second that we own; B has one just like it in her room. I’m not one to spend a bucket of money on a crib. This one has clean lines, is sturdy and affordable, and can be converted to a toddler bed. The large Mary Cassat poster was in my room when I was growing up; my mom had it lying around and I gave it a new frame and a new home. I think it’s especially sweet now that I have two little girls. The “Texas Love” print is from Austin-based Etsy shop, Owl U Need Is Love. I embroidered the “Practically Perfect” hoop myself after I was inspired by this one — I just free-handed the letters and umbrella. I always love a nod to Mary Poppins. And I love BlaBla dolls. This dresser is a hand-me-down that Jordan and I have had since we were first married (10 years this year!). It has been many colors and served many purposes in our home: buffet/sideboard, console, office supply storage, clothes dresser, and now baby changing station. Strangely enough, I had already painted it this bright aqua color several years back, and had been meaning to repaint it a different color for a while. But the aqua ended up working well for T’s nursery. Hopefully you’ll remember the mobile I made from wool felt balls. We hung a simple Ikea shelf to hold an old lamp I had hanging around (also from Ikea) and some baby supplies. 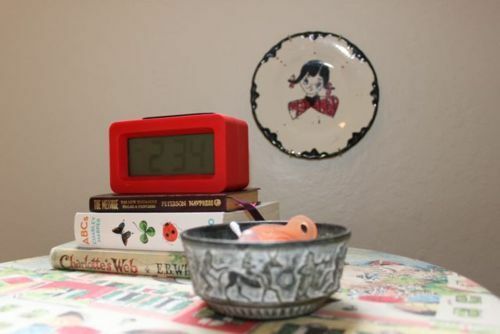 The Raggedy Ann plate is one I found at a thrift store some years ago for about ten cents. And Aurelia picked up the sweet sheep collage by Cate and Levi Collection in a boutique on a trip to Portland; it’s made from recycled and re-purposed wool sweaters. I framed one of our baby party invitations, which you may also remember. I’m so happy with our sweet nursery. T doesn’t actually sleep there yet except for naps, but as she transitions to sleeping in her own room I think we’ll love the room even more. So far it lives well and has a cozy, fresh feel. Hi all! 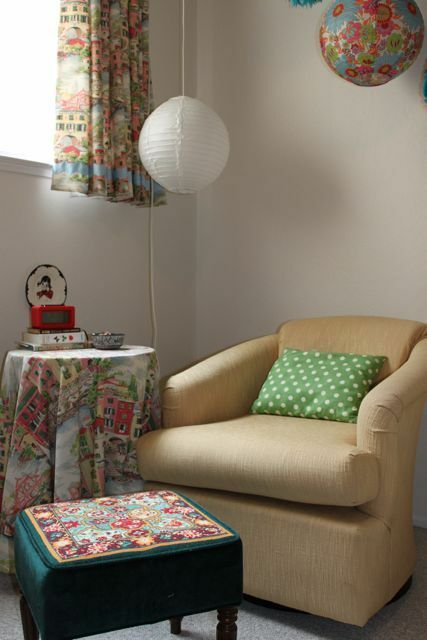 Today we have another inspirational guest post from Stephanie of Teal Annie! We have been having a sort of count down to Christmas this week with all kinds of frilling and festive posts! Yesterday, Fran posted about some natural ways to have that special Christmas tree fragrance if you don’t have a real tree in your home. And the day before that, Caitlin posted about her entirely handmade Christmas ornament collection! AND Check back tomorrow for yet another fabulous guest-post by Stephanie! My husband and I have been married for a little more than two years. This year we started thinking about Christmas traditions that we want to have as a family. We’ve though about what traditions we want to continue that we each had with our own families and some new things we would like to add. This year we decided to make an Advent calendar to help us think of others and to be excited and expectant for the coming of Jesus. We used a scrap piece of wood we had in our garage. 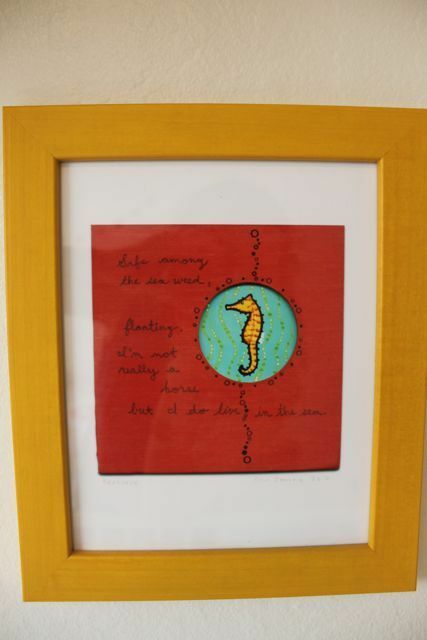 We painted the lyrics to Joy to the World on the wood and used some yarn and scrapbook paper I had in my craft stash. We each wrote on half of the cards. I open the ones Jake wrote and he opens the ones I wrote so it is a fun surprise each day. We wrote things like: “Buy a friend’s lunch today”, “Read the Christmas story together”, and “Bake cookies for the neighbor”. We also light a new tea candle each day when we open a card. I hope everyone has enjoyed the Advent season and has a Merry Christmas! Introducing, my first ever pieced together quilt! I made it as a baby gift for my childhood friend’s first sweet baby. She wanted purples and blues, so here’s what I came up with. My amazing mom-in-law helped me EVERY step of the way. I couldn’t have done it without her! My mother-in-law added these sweet frills: the baby’s monogram, a surprise cupcake stitch, and a patch on the back of the quilt with all the important info. Very nice! Hi all! This week Stephanie of Teal Annie continues her guest post collab with us, and we couldn’t be more impressed by her constant creativity. Also, don’t forget to check out her etsy shop for some great Christmas gift ideas if you haven’t already! This past weekend my husband and I participated in our first Arts Festival. It was a festival in our town that featured local artists and their work. I sold my repurposed jewelry as well as my collection of vintage clothes and purses. This festival gave us the opportunity to meet and talk with the locals about our work. 1. Select display racks/stands/containers that will showcase your goods clearly and organized. You want your goods to be displayed in a way where customers can easily touch, pick up, look at, and put back your goods. The items should be shown in a way that is visibly nice to the eye and as the actual item will look when in use. For example, I have the necklaces hanging and laid out on the table as they would look when worn, instead of tangled in a bowl. I also included a mannequin bodice wearing a dress and necklace to help the customer visualize what the items will look like when worn. I used a wire basket for small clutch purses, an old metal rack for larger purses, and a metal clothing rack for hanging the vintage clothes. 2. Clearly price all of your items, and display your shop name. You can include a label/tag on each item, or if all of your items are the same price, you can just make one sign that says “All items = $$.” This is probably the most important tip because we all know it is sometimes awkward when asking the price of an item. You should also have your shop name/brand displayed in an area that is easy to see. My husband hand-painted this awesome sign for us to set up on the sidewalk for passerby’s before they came in to see each of our separate display spaces. 3. Have your business cards easily accessible to customers. Have your cards located on your main table where customers can take one if they want. You can also include a card with the purchased item. If you have never participated in an arts festival and want to, I encourage you to go and check out some of your local festivals and start planning your festival debut! It is a lot of fun and is a great way to meet artists/crafters/bakers and other locals. If you are familiar with festivals, I hope this has provided some inspiration! And if you just attend festivals, then continue supporting your local artists; they love sharing their goods with you! Hi all! Today marks the first guest post of many to come from Stephanie of Teal Annie, and we thought we’d start things off right with a Frilling Fashionista post! What I love about Stephanie is that she knows who she is, and she owns it and rocks it! Her personality comes out through her style, and we just can’t get enough! Get ready to be totally FRILLED by her creativity. Also, don’t forget that it’s not too late to enter the Teal Annie giveaway! Hello! My name is Stephanie Dugard, and I’m here to tell you a little bit about myself, my love for finding old/vintage items, and how I’ve learned about my personal style. Finding my own unique sense of style has been a creative process. I can see how it has developed and changed over the years. While in middle school and high school, I began venturing out and wearing crazy outfits and pretty much anything that was different and would distinguish me from someone else. I then became very interested in vintage clothes and thrift shopping. I have a few go-to pieces that I wear every day or every other day. I will literally wear something until it is unable to be worn…until it rips or falls apart. My go-to item at the moment are these jean shorts and band tee. I wore the shorts all summer and now can pair them with black, grey, or wine colored tights for the fall/winter. I CAN’T STOP WEARING THEM. They will one day soon fall apart, and then I will have a new go-to piece..and that’s the way I like it! I mostly shop for clothes at thrift stores or my sister’s closet. I tend to make 2-3 more expensive, quality purchases a season on staple items I really, really want. For the fall, I splurged on these boots from Urban, a screen printed pullover from Blackbirdtees on Etsy, and some tights from Gap. I’ve been able to blend my love of vintage and thrifted items, my learnings from experiments with repurposing old clothing, and what I’ve seen in fashion through the years into my own unique individual style. At this time, I would describe my style as Vintage Fun with a flare of Boho Rocker. Here’s another peek at our beloved nursery. When you live in a rental, the details become all the more important. Since I can’t change the bones of the place, I need heartfelt details to make it feel like a home. Here’s where we sit and rock. My mom sewed the pillow of the same green and white polka dot fabric as the headboard. The tablecloth is the same fabric as the curtains. I’m not into matchy-matchy where fabric is concerned, but my mom convinced me to pull these fabrics in again to make the room more cohesive. I picked up the vintage Raggedy Ann plate at a thrift shop for 50 cents. 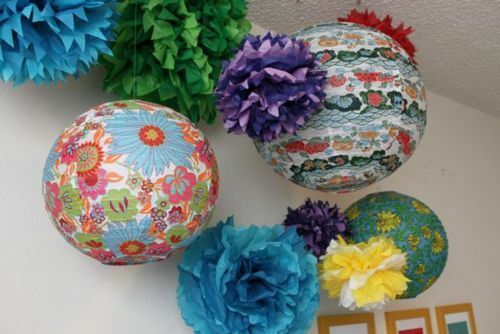 I was inspired by Ashley Ann to make the tissue poms, but made the idea my own with the addition of Japanese rice paper lanterns and the bright color scheme. The prints are digital illustrations by Erin Zamrzla, which I snagged at the 2010 Renegade Craft Fair here in SF. 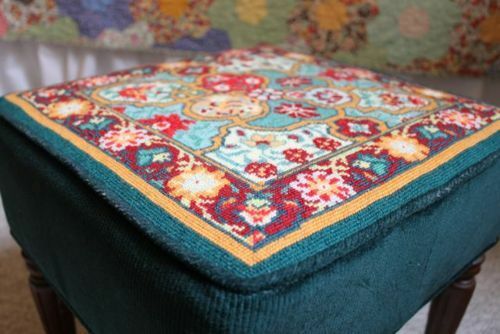 The ottoman was needlepointed by my grandmother. 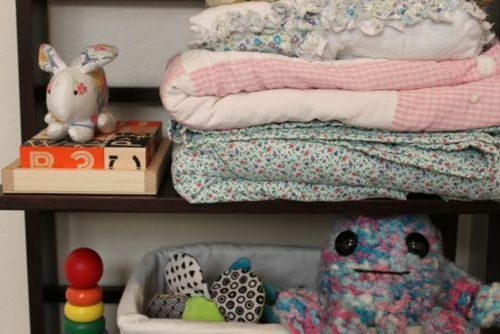 All these handmade details make the nursery our favorite room in the house. Hope you enjoyed the peek. We love our nursery. What I especially love about it are all the handmade details in it that are unique and special. I have posted about the nursery before, but I wanted to share some of our darling details. You should know, my mom did ALL of the sewing, and most of the manual labor of putting the room together (with help from my aunt) since I was lazy 36 week pregnant at the time. I art-directed; she implemented. 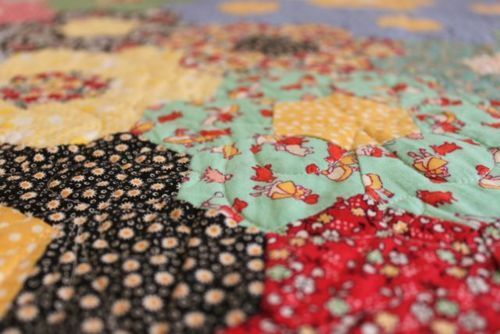 By far my favorite item in the room is the quilt of 1940’s vintage reproduction fabric, lovingly hand-pieced especially for Baby B by my mom. 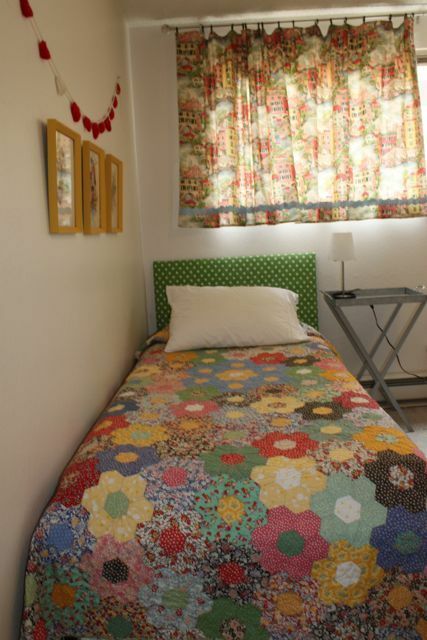 We covered the plywood headboard with batting and green polka dot fabric. 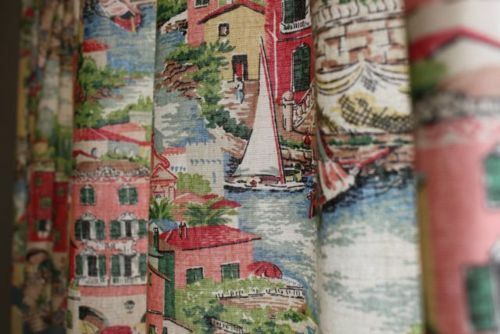 She also sewed the curtains, which are patterned with a whimsical cityscape that feels like you’re looking at the pages of a storybook. The prints were a serendipitous discovery. My mom had spotted a trio of framed vintage prints of illustrated nursery rhymes, and picked them up for a song at an estate sale. 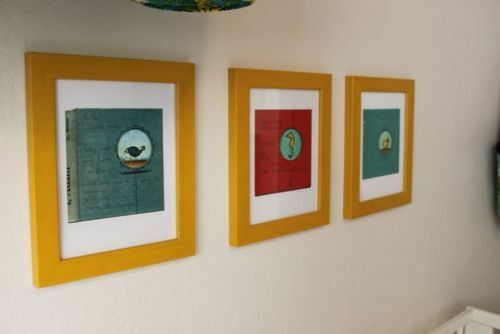 When we took them out to paint the frames yellow, we discovered these limited edition vintage bird lithographs by J. Gould and W. Hart, hidden behind the nursery rhymes. Turns out they’re worth more than a song. 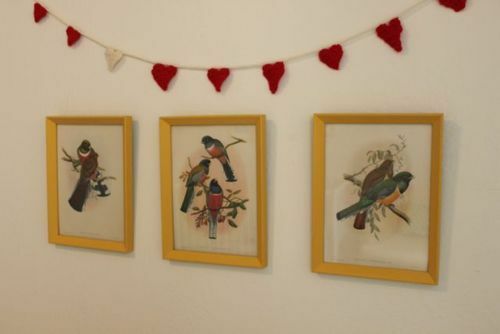 We had some lengthy discussion about whether to hang the nursery rhymes or the bird prints, and in the end, the richly-colored birds won out. I made the crochet heart bunting. 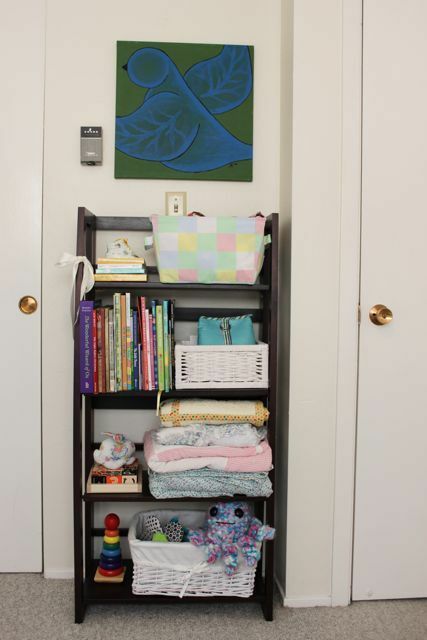 The bookshelf holds our collection of handmade baby quilts, children’s books, and toys. I made the bird painting in 2006. The crochet octopus is by Dorklandia. Er, pretend you can’t see the thermostat. 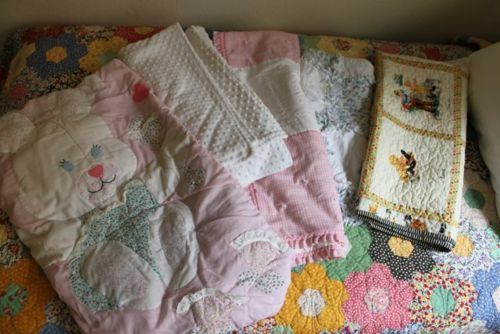 Some of the quilts were my baby quilts made by my great aunt, others were made more recently and given to us by friends and family. 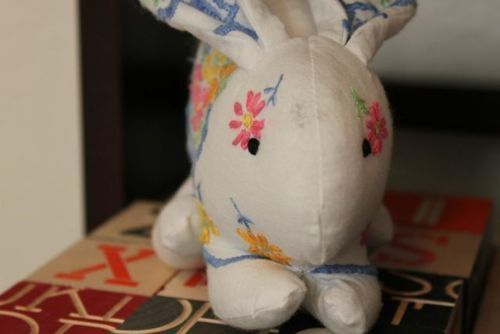 This hand-embroidered bunny is one I originally saw on Bleubird, and it turns out she got hers at a little boutique not far from where we live. I had to have one. 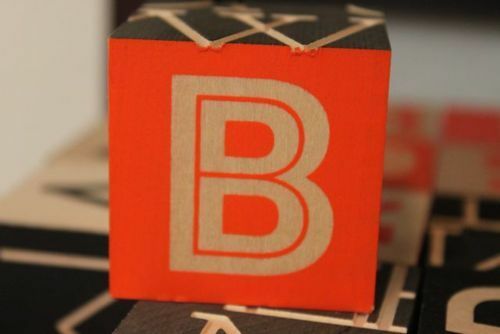 We love our wooden blocks from House Industries. They’re made of sustainable wood and non-toxic inks. 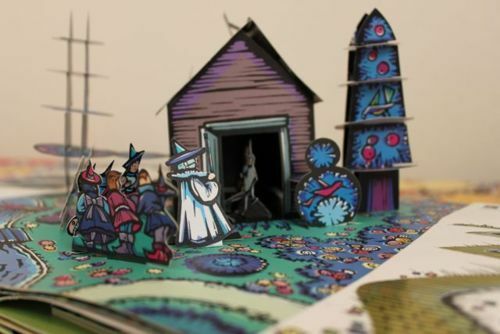 And what children’s book collection is complete without a Wizard of Oz pop-up book?